I've always had a passion for filmmaking ever since I was little. My first camera was made out of toilet rolls and cereal packets. Needless to say a lot of this early footage has long been lost, though the memories of blackmailing my brother to dress up as a chicken and perform are still as vivid. 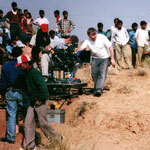 In the past 14 years I have worked as a cameraman on many productions. Documentaries to big budget feature films and still I find myself returning to make small independent films. I get a kick out of working with people on their first films. I think it's their sheer enthusiasm and lack of cynicism that makes me realise what a wonderful medium this is and the power it has to unite people. My ambition with Lampshade is to create an environment where everybody has the right to freedom of expression, a place to exhibit their work and a forum for debate. I believe with organisations like ourselves that we can make a difference to the world and the people around us. Through work in press and broadcast in different countries I have come to realise that far too many people suffer from a lack of voice in the media. I have witnessed first hand the distress people living under censorship experience and how it affects all our every-day lives. I think Lampshade will provide these often unheard people with a platform from where there are no limits to their creativity and at the same time knowing that people around the world actually are interested and listening to what they want to say. To create a site for developing communities to make and exhibit their work. To give people an opportunity to exercise their right to freedom of expression. To offer training, equipment and support. To provide a space for debate and communication, open to all. To make a sustainable business that doesn't solely rely on charitable or governmental support. To financially reward the filmmakers for their efforts. To make the latest technologies accessible to all. To encourage business to engage with the local community. We want to address the lack of balance in the media when it comes to the developing world. Much of what influences our perceptions of the Southern hemisphere comes from media's focus on negative aspects, such as poverty, aids, war and famine. Although this reporting is vital, very little positive aspects of what people are already achieving, such as being world leaders in mobile commerce technology, are being reported on. Our site aims at showing our similarities, rather than differences through peoples thoughts, aspirations and creativity. By giving communities access to equipment and training, we give people an opportunity to express what they really feel about their environment, and for us, we get a much needed balance from traditional reporting. Doing so, this could lead to a deeper understanding of the political and social factors and problems people face. To provide these facilities we will be setting up video production bases. These will work with local businesses, organisations and NGOs to train and equip people with the necessary skills to make five minute documentaries. Our aim is for these bases to be fully sustainable businesses that will continiously utilise the skills the people have been taught. By working with local business they will be able to run autonomously, bringing in their own revenue by making e.g. commercials, corporate videos and news reports as well carrying on with community filmmaking. As a commercial operation we believe that people should be remunerated for their work. Our contributors will be paid a 50% share of our pay per click advertising from advertisements' clips added to the end of their films. Our site aims to further promote the films by encouraging the viewer to comment and debate the issues raised in the clips. We will be adding v-blogs, forums and channels for discussion. Through the information bar, we will add extra articles and links related to the topic of clip, the filmmakers and their country. Essentially we believe that all in all, a vocal community working together is hard to ignore. To help us take this project further and realise these goals we need your help with funding and sponsorship opportunities. To complete the website, taking it from its present prototype state to a fully functioning body. Create contacts with Filmmakers, NGOs and other Organisations working in the field. Increase our user base through marketing and search engines. Secure funding for a least one video hub in Africa. Attract advertisers to sponsor the films. Evaluate payments by mobile commerce.